You wake up early, do your morning routine, and then go to work. You spend hours at the office while waiting on others to produce reports. You crank out projects. And, let’s not forget the meetings you sit through. You leave the office 12 to 14 hours later only to miss family activities and dinner. By the time you get home, you are exhausted, frustrated, and completely drained. Working out? Hobbies? Social life? Church or faith activities? Forget it. You have nothing left to give, because you gave it all at the office. Can you relate this scenario? If so, chances are your life is not in balance. Work is outweighing all other areas of your life. Your life balance is out-of-whack! As a result, you are stressed and unhappy. There is a solution. Complete a Life Balance Assessment, explore how you can achieve balance, set your boundaries and start implementing change. First, let’s define work-life balance. The Cambridge Dictionary defines work-life balance as “the amount of time you spend doing your job compared with the amount of time you spend with your family and doing things you enjoy. “ If your life is balanced, you are proportionately giving necessary time to various areas of your life such as family, career/work, health/fitness, faith/spiritual, social/friendships, personal growth, finances, and your living environment. What happens if your life is not balanced? Look at your life as a car tire divided into eight sections. If one of those sections is heavier than another, or the tread is wearing out, you may have a blowout. Regardless, you will not have a smooth ride. On the other hand, if each one of those sections is running properly and proportionately, that tire is going to ride smoother and more efficiently. If you are spending all your time at work and not finding time to work out, you will start to gain weight and your health may be effected. If you are not finding time for your faith, you may begin to lose hope or have a difficult time finding joy. And, if you are unable to be a part of your kids’ activities, you will start to see an impact on their lives. How do you find balance again? Awareness is key in achieving life balance. The first step to finding your balance is ranking areas of your life and discover where you need to focus. You can download the assessment here. This tool will help you discover what area of your life is taking over and where you need to reallocate time. What do I need to do in order to make changes? What will happen if I don’t make any changes? Based upon your evaluation, determine if you want to move forward. If you do want a more balance life, then set goals with deadlines. Begin implementing a plan to have a more positive and balanced life. You realize you spend 60+ hours per week working and your health is suffering. Consider resources, such as hiring a Life Coach to help you gain more balance. You work 60+ hours and your travel is 90%. You never see your family and miss your kids’ activities. Set aside time each week for your family. Make the time an appointment on your calendar. Evaluate if it is time to look for a new job. If so, set a deadline as to when you will leave. Come up with a financial plan and a job search plan. Consider resources, such as hiring a Career Coach to help you through the process of finding a job. Imagine what your life will be like if you start implementing change. You will be amazed how taking positive action will give you hope. You will begin to feel joy once again. 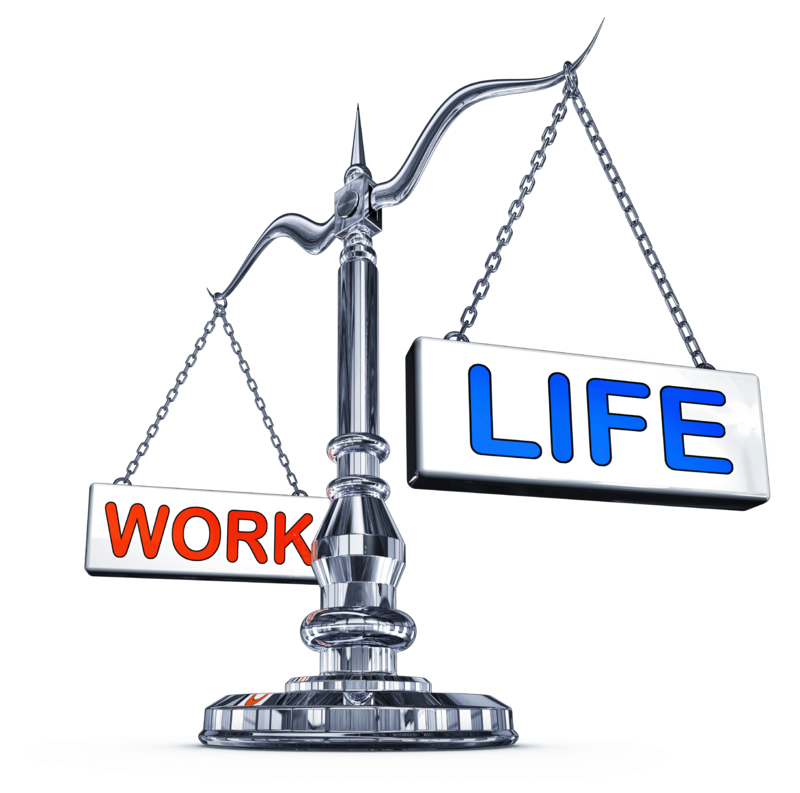 What questions do you have about achieving life balance? How can I help you find balance? Feel free to write your comments below. This seems to be a constant re-balancing for me, Staci. Two years ago, I made a five-year plan to write more, edit less, and took the appropriate steps to get there. Now, in the thick of that, I seem to be working more than ever! So, time for yet another re-balancing. I really like the ‘what if’ questions. Those are truly helpful–thank you! Thanks for reminding me of what work life balance is. I think sometimes I stop being motivated because I am just tired. Tired of doing tasks… all the time… That’s when I stop, disconnect and do nothing. It’s really important for me because it helps me be even more creative. Great analogy with the tire and the risk of a blowout! A balanced life is certainly a happier one. You’ve provided a lot of good questions and food for thought. I’m not sure I believe that we’re ever 100% balanced, but I believe making an effort to be more balanced does help improve our lives. Staci – Great post. Growing up, my family was very transient. I went to 13 schools before I finally dropped out (I subsequently went back and eventually got my masters degree). Anyway, I swore that I would not put my children through that non-stable lifestyle. Each of my children, however had to move once in their first twelve years of schooling. Looking back, I’m so glad they were forced to move. It helped to teach them that if they’re in a crappy job, marriage, etc. moving on can be difficult but do-able. Implementing the change you talk about can cause paralyzing fear – especially in this economy for us older folks, and it helps so much to know it’s just not that bad! Getting the balance just right can be so hard. My job as an art teacher only takes me away from home a few hours each week but it’s the writing and blogging that is a big time guzzler and I’m forever assessing to make sure I don’t allow that to take over and miss out on life or that life’s obligations don’t keep me away from writing – quite a balancing act.Your tips for assessing and prioritizing are very helpful. It’s a little different for me, since I work AT home… it actually requires a little more effort to keep the work/life balance as I get interrupted.. and then again, I can stop to go pick up the kids and work later to compensate and more.. great stuff, we all need this! In some ways, my work life was more balanced when I went to a 9-5 job. I left my day job in the office & had hours to do things I liked or meet friends for dinner. As an entrepreneur I work longer hours, often include weekends, but as I love what I do, it doesn’t feel like work. I still make time for friends & family & my interests, so all is well. I learned long ago that somehow my work life and my personal life are always intricately intertwined. It is still that way. Because the world around me offers constant inspiration and opportunity, I don’t distinguish between something that is personal vs. something that is work. I also have learned that having a moon in the 5th house in Pisces, means if I am not happy with my work, my health is impacted. A very dramatic way to stopping and checking if life is flowing and in balance. I honestly do not know how to separate the two, and working from home, not in an office, isn’t really my solution. I appreciate that for many people they are working long hours in an office environment and often forget to take time for themselves. My health issues became my wake up call and now I do put myself first and know very quickly when things are out of balance for me. Thanks for sharing the wonderful tips in this post, Staci, and for reminding us all to stop and check in with ourselves and to strive for balance at all costs. Overall balance is so key to a healthy life. There are always times one thing or another might take priority, but in the large scheme of things it is so important to cultivate an interest in all areas of your life. It keeps your mind, body and spirit happy. You are so right, we must balance our work with our lives, because without balance and focus we will not be able to work and live up to our FULL potential! This is so important… Many people don’t realize it until it is a serious situation, and they are miserable. As you said, awareness and action is the key! All super suggestions and the most important one is this: Make the appointment with yourself to do what you want to do. Otherwise, it. Will. Not. Happen. You schedule time for other important people and activities in your life — why are YOU not on your own list of important people? As a coach, I’m sure you see that all the time, too, Staci. Good stuff here! Thank you, Jackie! And yes! It’s amazing how we forget to make that appointment with ourselves. We owe it to ourselves to make the time and make it happen! Thanks for stopping by! Yes, Kimberly! Awareness and action are key. We have to know and accept what we need to change in order to move forward. Then, we MUST make that appointment with ourselves and take action. Thank you for stopping by! Well said, Joan! I see so many people that are missing out on family or have poor health because their focus is all on work. They feel pulled but don’t know how to find that balance. Thank you for your feedback and stopping by! So true, Karen! We need to stay in balance to have a healthy mind, body, and spirit. There is so much joy in life to experience. But, when we are pulled, it is hard to find that balance. Thank you for sharing! Very well said, Beverly! Many of us have work and personal life “intricately intertwined,” especially if you own a business. But, checking in with ourselves is very important. Kudos for putting yourself first and knowing when life is getting out of balance. As always, thank you for your input! When you love what you do and do what you love, it is easier to find and feel balance. It is very obvious that you love what you do, Roslyn as your passion shines through everything you create. That is awesome! As entrepreneurs, we may work longer hours and our work week may vary. 😉 Kudos for making time for your friends, family, and other interest. I agree, Kristen. Being a business owner and working at home does require more effort to keep things in sync and balance. If we have kids, our hours may not be the typical “9 to 5.” That may be how we are maintaining a balance with family, work and other areas of life. And, that is awesome! Thanks for sharing! Thanks for sharing Tamuria! Writing and blogging can be time consuming! I will recommend to clients to take a step back and evaluate the “time guzzlers.” For instance, are they the most efficient use of your time? Is there a way to delegate or do it differently? Once you start brainstorming and implementing, you will be amazed at the results. Kudos for assessing and being aware. It is a balancing act. If you want some ideas, let me know. Thank you for stopping by! Kudos for teaching your kids valuable lessons about change. And yes, change can cause a paralyzing fear. But, WOW….change can also be freeing. And, change is sometimes a necessity in order to find balance. Thank you so much for stopping by and sharing, Joan! Thank you for sharing, Meghan. A blowout is definitely and extreme, but it can really happen. 😉 In reference to balance, I understand what you are saying. I think problems arise when we completely ignore or block out an area(s) of our life while putting emphasis on other areas. Awareness is key. Thank you for stopping by! Thank you for sharing, Sabrina! I completely understand what you are saying. I am project oriented (rather than task oriented). Being aware of your behavioral style and strengths are also key to achieving balance. For my clients, we evaluate strengths and where their time is most efficient. Then, we come up with solutions on how to accomplish other tasks/responsibilities. Feel free to email me if you would like more resources about this. Thank you stopping by! Susan, kudos for writing a five year plan! I’m glad the what-if questions are helpful. I’m curious, is the writing more creating more work for you? Would love to know why you are working more than ever. Feel free to email me or comment here. Thank you for sharing! For me it is worthwhile to see balance as really more about always finding balance within the dynamic tension of possibilities that surround me. It’s like the quote that says, “life is not about waiting for the storm to pass, it’s about learning to dance in the rain.” I’d always rather practice how to manage the dynamic tension of possibilities than to turn down or deny opportunities in the name of balance. Beautiful quote. I believe if an opportunity is right for me, then the right balance can be achieved. Thank you for sharing! That is fantastic, Liz! And, quite a challenge. Kudos for being proactive (vs reactive) to try to maintain balance. Thank you for sharing!